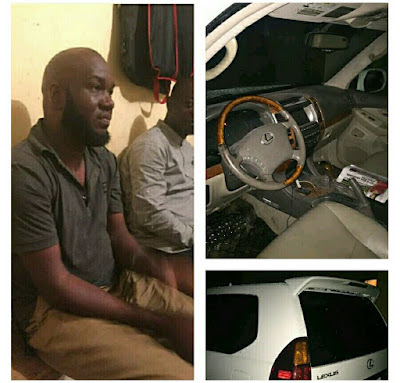 A man was arrested after purchasing a stolen Lexus SUV for N500,000 in Abuja. After repainting the vehicle and changing the registration, the took his friends out to celebrate his “new vehicle” not knowing the car had been tracked to their drinking spot. “Last night ended very well with a successful recovery of this stolen vehicle. In brief, the suspects in the pictures moved the vehicle on the 16th of this month somewhere around Garki area 3 Abuja from a parked location. The client instructed his driver to park the vehicle at a hotel in Abuja after dropping him at the airport on his way out of the Country.